We have been experimenting with some recipes for Scotch Eggs and have come up with some real corkers ! They have proved to be a real hit with customers and us selling out of them too quickly ! Each week so fare we have increased production to try and keep up, we make em fresh every Thursday so pop in and sample some soon. New Easy to Cook Range Now Available, Let us Inspire Dinner ! We have just launched some really easy to cook products that require minimum preparation time for you and offer a quick and easy solution to dinner ! We had a great day in November 2011 to celebrate National Sausage week. We got through to the finals and was lucky enough to attend the 'cook off' in a Restaurant in Nottingham city centre. 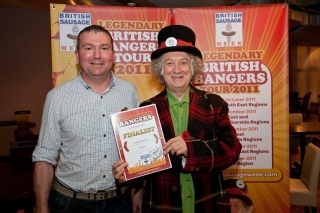 There to assist with the Judging was Noddy Holder legendary lead singer with Slade. My Sticky Sweet Chilli Sausage once again did me proud and we came away with a finalist certificate. Also there was East Midlands TV and they interviewed me for that evenings local news. I got my five minutes of fame! 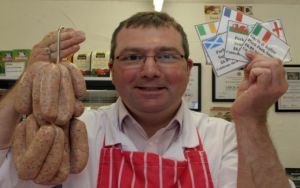 Sizzling sausages to mark an annual international rugby competition have been created by a village butcher. Jake Fleetwood, of Crich Butchers, is getting ready for The Six Nations Championship by making six different sausages to represent every nation, to eat while watching the games. The shop, in the Market Place, will also be hosting tasting sessions to co-incide with the games. There has been a Butchers Shop in Crich Market Square for well over 100 years, today it is owned and run by Jake Fleetwood who recently bought the business from Ray Elliott who ran the shop for nearly twenty years. Jake has a wealth of experience working for over thirty years in the meat trade, also alongside a number of farm shops as a consultant helping them set up and expand their business. Since June of this year Jake has been at the helm, building upon the already loyal customer following. From Monday the 1st November through to Sunday the 7th November 2010 Crich Butchers celebrated National Sausage Week. Jake and his staff invited all to call in and sample well over twenty various types of sausages they have on offer. 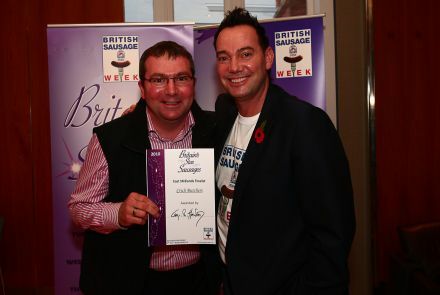 National Sausage Week was supported by Strictly Come Dancing judge Craig Revel Horwood and Jake went through to the Regional Finals and entered into " Cook Off " with his Sticky Sweet Chilli Sausages, judged on the 4th November at Harts Hotel in Nottingham. So if you are visiting Crich soon, or you are local to the village pop in and say hello and take a look at the produce on offer.